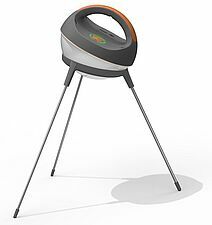 The Barefoot Go portable solar light has been specifically designed to meet the needs of rural markets. The ultra-bright lamp can illuminate an entire room or shop. Multiple brightness settings allow the user to conserve power until it’s needed Barefoot Go includes a 1 Amp USB output capable of charging smart phones and other devices. The versatile design and stand make Barefoot Go perfect for any location and situation. Barefoot Go includes a 2.5W poly crystalline solar panel combined with microprocessor-controlled battery management to maximize battery performance and life.